Music lovers attending the RiZE Festival should look out for symptoms of measles, a doctor has warned. Dr Danny Showell of Public Health England said the festival will be "the perfect situation for the virus to spread" following an outbreak of the infectious disease in Essex. So far, 12 cases of measles have been confirmed in the county this month; an unusually high number. The RiZE Festival, at Hylands Park, Chelmsford, runs until Saturday. The MMR vaccine can prevent it, but research published 20 years ago linked it to autism. Although that claim has since been discredited, many people were not vaccinated as a result of the scare - and are now at risk. Dr Showell said: "In this country, luckily, measles is now a rare condition so to get 12 cases in a short space of time in a limited geographical area is distinctly unusual. "The people who are predominately affected from this outbreak are young people aged 18-25. "This is the very cohort of people who are likely to be congregating at RiZE Festival this weekend. "A large number of them won't have been vaccinated because there were scares earlier this century that the vaccine was dangerous. "It's the perfect situation for the virus to spread." 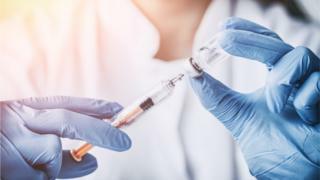 Symptoms of measles include a fever, cough, runny nose, sore eyes and a distinctive red rash but the fever is "a key one to look out for", according to Dr Showell. "You become infectious to other people as soon as you start feeling unwell," he said. "If you get to the festival and develop symptoms, alert the authorities and exclude yourself." Measles cases in Europe increased four-fold in 2017, affecting more than 20,000 people and causing 35 deaths.